1. A series is given, with one term missing. Choose the correct alternative from the given ones that will complete the series. 142, 253, 364, ? 2. If AUTUMN is coded as ZTSTLM then how SPRING is coded in that language? Preceding letter of the alphabet series is coded. 4. If all the ‘$’ are left out, then what is the number / symbol which is seventh to the right of fifth from left end? The kaleidoscope, Microscope, Spectroscope is an optical instrument. 6. Select the related word/ number from the given alternatives 15 : 4 :: 21: ? 7. Select the related word/ number from the given alternatives. Fiscal deficit: Central Bank ∷ Budget Deficit: ? Fiscal Deficit is related to Central of the Country. Similarly Budget Deficit is related to Parliament. (8-10) Read the following information carefully and answer the following questions. A, C, D, E, F and G are sitting around a circle facing the centre, not necessarily in this order. D is second to the right of A. C is third to the right of A.G sits third to left of D.
8. Who is sitting to the immediate right of C? 9. What is the position of G with respect to E? 10. Who sits to the immediate left of A? 2) If AUTUMN is coded as ZTSTLM then how SPRING is coded in that language? 4) If all the ‘$’ are left out, then what is the number / symbol which is seventh to the right of fifth from left end? 15 : 4 :: 21: ? 7) Select the related word/ number from the given alternatives. Fiscal deficit: Central Bank ∷ Budget Deficit: ? (8-10) Read the following information carefully and answer the following questions. 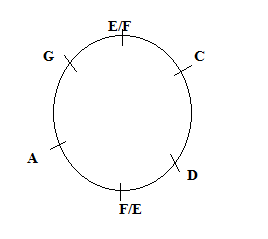 A, C, D, E, F and G are sitting around a circle facing the centre, not necessarily in this order. D is second to the right of A. C is third to the right of A.G sits third to left of D.
8) Who is sitting to the immediate right of C? 9) What is the position of G with respect to E? 10) Who sits to the immediate left of A?